Edinburg Mayor Richard Molina makes his closing remarks for Edinburg's second State of the City Address at the Bert Ogden Arena Thursday, Oct. 25, 2018. EDINBURG — City leaders here hosted a second State of the City Address at the new Bert Ogden Arena Thursday, and in many ways, it mirrored the event hosted six months ago. Mayor Richard Molina made a grand entrance again, beginning with the same song he used in April: Flo Rida’s “Welcome to My House.” Except this time, instead of making his way to the stage like a champion boxer, he found some friends along the way. In a carpool-karaoke-like video, Molina stepped into a Denali and picked up Janet Vackar, Robert Vackar and Alonzo Cantu, three of the city’s most influential figures. Together, they jammed out to a number of songs for about 10 minutes before physically driving in to the arena, where they were met with Vipers cheerleaders and hundreds of attendees. Gone were the protesters that inundated the last address, donning red shirts calling for a recall. Instead, city officials and attendees enjoyed a meal as the mayor touted updated figures for construction, unemployment and investments made to public safety and drainage, among other things. 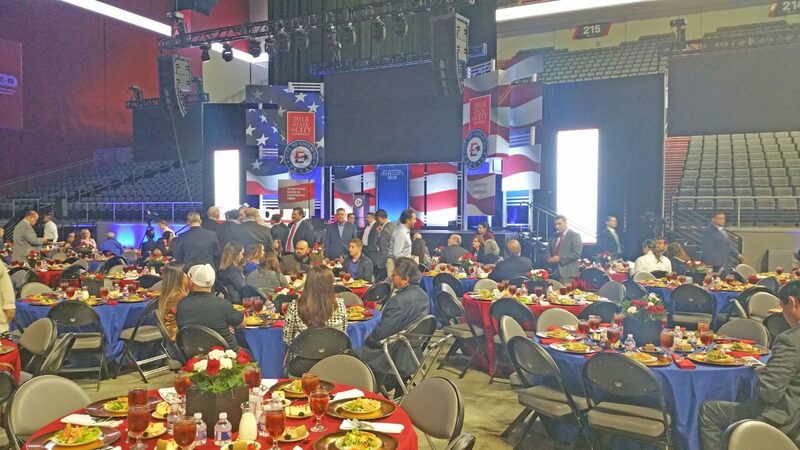 Hundreds of guests wait for Edinburg's second State of the City Address to begin at the Bert Ogden Arena Thursday, Oct. 25, 2018. 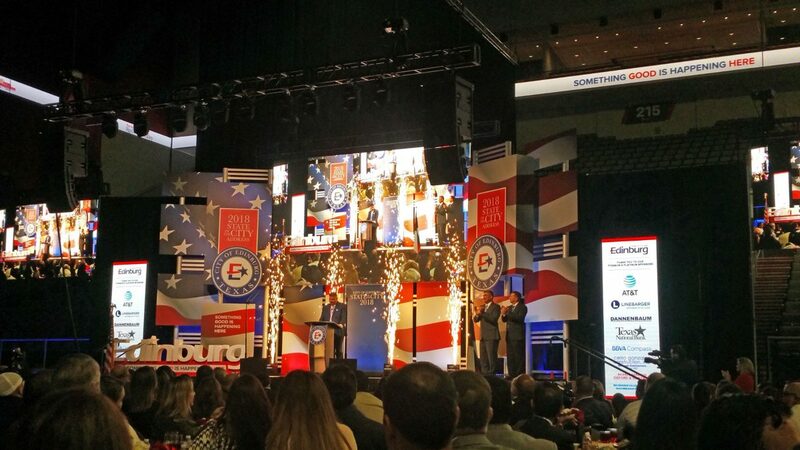 “Edinburg is the fastest-growing city in the Rio Grande Valley,” Molina said. In the last 11 months, the city has issued 1,449 building permits, which equal to about $65 million worth of commercial construction and $98 million in residential. Sales tax revenue grew by about 7 percent with annual taxable sales of about $1.1 billion, Molina said. The city also boasts the second-lowest unemployment rate in Hidalgo County, and the Edinburg Economic Development Corporation played a part in adding almost 400 jobs to the market in just the past 11 months, he added. “It sounds to me like something good is happening here,” Molina said, once again echoing the theme of the address. He went on to tout the venue, which was built through a private-public partnership between the Vipers LLC and the city, saying, “The city made a huge investment here.” The arena has already created 150 jobs and experts at the University of Texas Rio Grande Valley estimate it will create an annual economic impact of roughly $45 million. The mayor also reminded the audience that the city recently committed to make a $1 million donation to the UTRGV School of Medicine. Edinburg has also invested in its parks and the quality of life of its residents. Crews resurfaced the trails at the Edinburg Municipal Park, also known as Doolittle Park, and added a slew of amenities to other green spaces across the city, including benches, BBQ pits and even basketball courts. The city council also invested in new fire trucks, police units and recently updated its radio system. Edinburg’s airport, named the South Texas International Airport, also recently received a grant from the Texas Department of Public Safety, and the city plans to use the funds to update a masterplan and is looking at the possibility of installing a solar energy farm on the land that is not being used. During the event, city leaders presented three $1,000 checks to three nonprofits: Naveah’s Kidz, Estrella’s House and the South Texas Literacy Coalition. They also recognized Sonia Enriquez, an active member of the Kiwanis Club, as a community champion. “She does it because she sees the importance of making children smile,” the mayor said about her extensive public service track record. And in his closing remarks, the mayor thanked those who carry out the council’s vision. “Our success is also thanks to every single person who works for the city of Edinburg,” he said.